Translation of “Fidesz has its two-thirds parliamentary majority, they finished tallying the vote” appearing in daily online 444.hu. The tallying of all votes cast in last Sunday’s parliamentary election has been completed, and the final result has been published for each electoral district. The Fidesz-Christian Democratic People’s Party (KDNP) alliance will have a two-thirds majority in the new parliament. Based on the final tally, Fidesz-KDNP candidates won in 91 out of 106 districts, Hungarian Socialist Party (MSZP) candidates in eight, Democratic Coalition (DK) candidates in three, and Jobbik and Politics Can Be Different (LMP) candidates in one district each. One Együtt (Together) candidate obtained a mandate, and one independent candidate also got into parliament. From their respective national party lists, Fidesz-KDNP will send 42 delegates, Jobbik 25 delegates, MSZP-P 12 delegates, LMP 7 delegates and DK 6 delegates. The Hungarian German National Local Government received one “discounted” mandate. 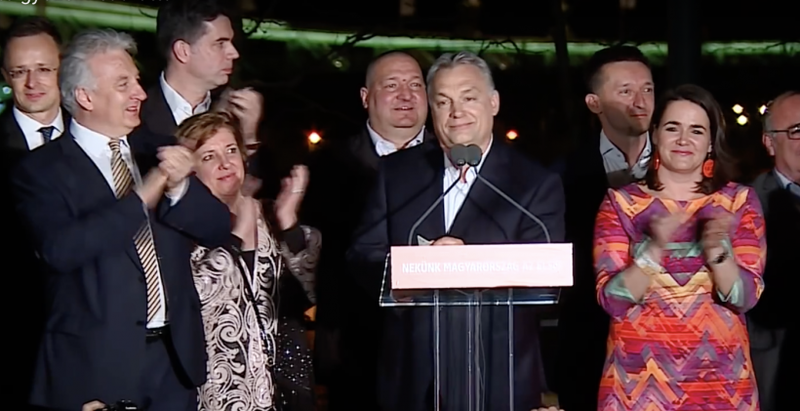 In the April 8 general election it was possible for citizens not present at their place of residence to cast a vote in another Hungarian settlement or at a foreign consulate. Since these citizens voted for representatives in their own residences, the votes had to be sent to the polling station designated in the electoral district according to their place of residence. The ballot boxes containing the votes were first delivered to the National Election Office (NVI), where they were sorted according to the 106 electoral districts, then the “final votes” were put into a transport box. Each electoral district could take delivery of its corresponding delivery box Saturday morning. Here votes cast earlier but not counted last Sunday night were mixed in and the votes were counted together. Following this the vote tallying committee determined the results of the parliamentary election by polling station. Afterwards, the national electoral district committee determined the result of the vote in each electoral district. The results have not yet cured.